Belvedere Designs: August 2016 Customer Photo Winner! August 2016 Customer Photo Winner! We received this photo from Tina who chose the perfect Wall Quotes™ decal - Fear of Striking Out - for this baseball bedroom! She ordered the 22" x 37" size in Slate and Black and I think it looks amazing. It is great placement for the room! 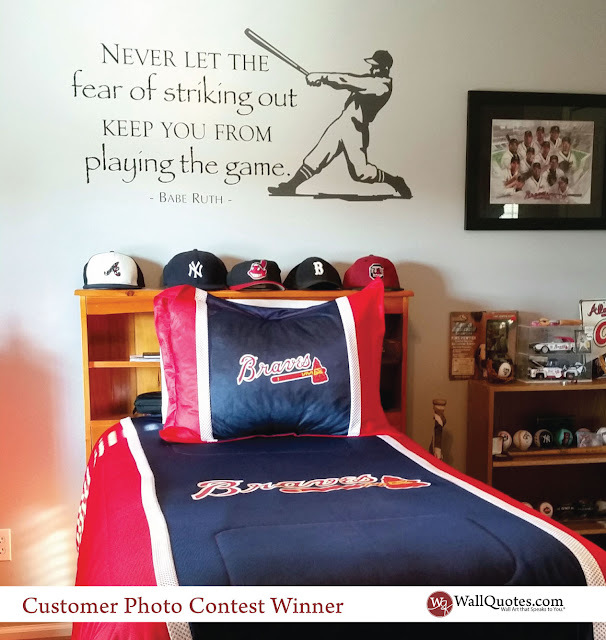 She says: "I absolutely LOVE the Babe Ruth wall design I ordered for my son's room. It is perfect!" We couldn't agree more Tina!